Some of the main features are covered below. For a full list see the Features List page. Quickly narrow down the client's favorites into the Yes, Maybe or No tabs. Use keyboard shortcuts (1 for Yes, 2 for Maybe, 3 for No) for fast selection. 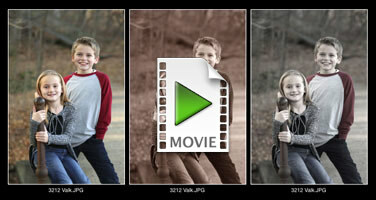 The next image is automatically shown ready for choosing. Zoom in and pan around mutiple images at the same time to easily compare expressions in a set of similar shots. Makes it super simple to select the best print in a lager group shot. One button click to apply reversable B&W and Sepia effects. Apply your own Photoshop Action effects with one click. Multiple applied effects are "stacked and tracked" and can be carried through to the final produced product. Effects can be applied to multiple images together. Create virtual copies (duplicates) to compare different effects side-by-side. "Finally, software that makes viewing and selling easy. I have tried many others, but some provide a nice slide show, some provide an easy way to compare images, none have given me everything I need in one place - until now! The ProSelect software is very easy to use, and the presentation to the clients is perfect. I am most impressed with the ability to crop, compare, and project actual size. Thank you for this wonderful tool!" 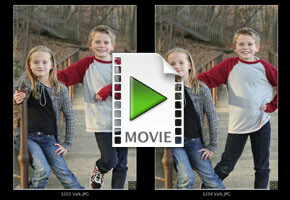 Cropping in ProSelect is fast and non-destructive (reversable). 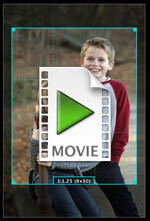 By default, it will snap to standard crop ratios but free cropping is just a keypress away. You can also crop all of your selected images at once. Show how small an 8x10 really is! Setup the sizes that you wish to show. 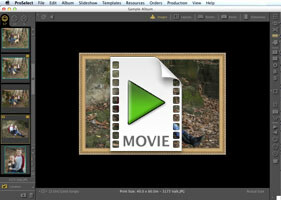 Show your images at actual size on a projector screen or big screen TV. Use the up-arrow and down-arrow keys to change sizes. Add a frame if you like. If you have two screens, you can use ProSelect's Mirror Display Area to show the images only on your second screen. Show one or more images on a room view background at different actual sizes. This makes it really easy for your clients to choose the best size for the space. You can use your room images or, for best results, use photos of your client's rooms.